"What is it with men and the last minute evening shirt purchase? Where did you leave your shirt last time you were out? I don’t need to know that. Here’s a picture-perfect, stupendous shirt made from the finest Egyptian cotton with a silky touch and remarkable lustre. You’ll remember where this one is." "Evening shirt made from long-lasting, soft-feeling Egyptian cotton. Ideal to pair with dinner suits." 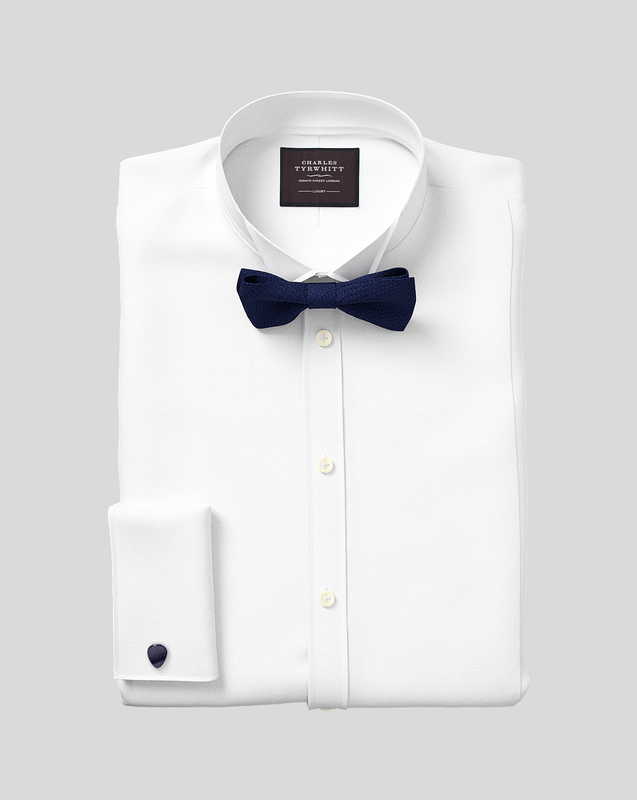 A wing collar is specifically designed for an evening shirt, to be worn with a bow tie and tuxedo jacket. It has two small “wings” that should sit flat (not point up) to show off your bow tie. A wing collar can be worn to black tie events, weddings, and other formal occasions. Quick delivery. Size as stated on the website. Would buy again. While I have yet to wear it formally, the quality if first rate. I plan to order the bow tie that goes with it in the near future. Slim fit removes the bulk of material that usually come from traditional cut shirts. Great shirt!